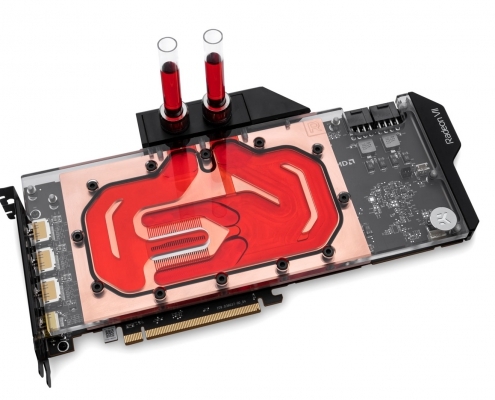 EK® Water Blocks, the leading premium computer liquid cooling gear manufacturer, is releasing EK-Vector Radeon VII water blocks that are compatible with reference design AMD® Radeon® VII graphics cards. This kind of efficient cooling will allow your high-end graphics card to reach higher boost clocks, thus providing more overclocking headroom and more performance during gaming or other GPU intense tasks. This water block directly cools the GPU, 16GB of HBM2 memory, and VRM (voltage regulation module) as cooling liquid is channeled directly over these critical areas. These newly developed water blocks feature a redesigned cooling engine that has a larger footprint compared to the previous generation of EK® Full Cover water blocks. This results in a larger surface area for heat transfer which increases the thermal performance of these water blocks. The base of the block is made of high-grade copper or nickel-plated electrolytic copper while the top is made of high-quality acrylic material or POM Acetal material (depending on the variant). The front aesthetic corner piece is lit up with LED strip (in RGB variants). The top material does not affect the block performance in any way. The block also features a special plastic cover over the block Terminal. This add-on is designed to reveal the graphics card model, visible from the side. Sealing is ensured by high-quality EPDM O-Rings. The brass standoffs are already pre-installed and allow for a safe and easy installation procedure. EK also encloses a single-slot I/O bracket which replaces the original two-slot in order to make installation of multiple graphics cards easier and also transforms the GPU into a gorgeous single slot solution. The EK-Vector Radeon VII water blocks are compatible with popular RGB sync technologies from all major motherboard manufacturers since it features a classic 4-pin 12V RGB LED strip. Liquid cooling your Radeon VII GPU will allow you to overclock it to the maximum clock allowed by the card and reach 10-20% better results depending on workload or game you’re playing. Even while overclocked your card will reach far lower temperatures and less noise than factory clocked with air cooling ensuring an even longer lifespan of the card. The EK-Vector Radeon VII water blocks and backplates are made in Slovenia, Europe and are available for pre-order through the EK Webshop or EK Partner Reseller Network. 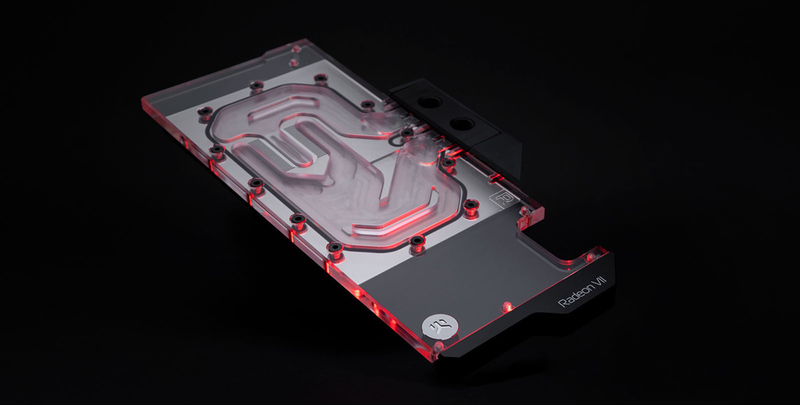 EK-Vector Radeon VII water blocks and backplates will start shipping Monday, 1st of April 2019! In the table below you can see manufacturer suggested retail price (MSRP) with VAT included.